This is my studio, which has beautiful north light. I love it! 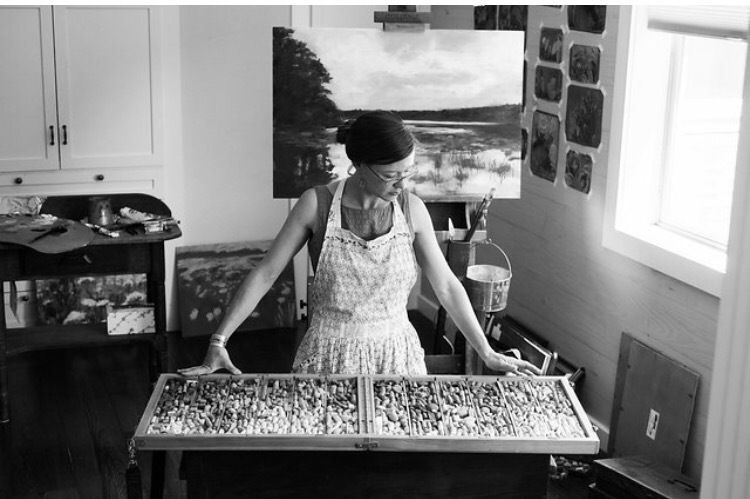 I count my blessings everyday when I go to my easel. Here is my taboret , if you look at the photo of my studio, you can see it. Just beyond that taboret (not pictured) is a washer and dryer. That blue piece of cloth is not an apron or a rag, far from it…it is one of my husbands nicest dress shirts. He absentmindly took it off and laid it on my palette covered in paint. Guess what? 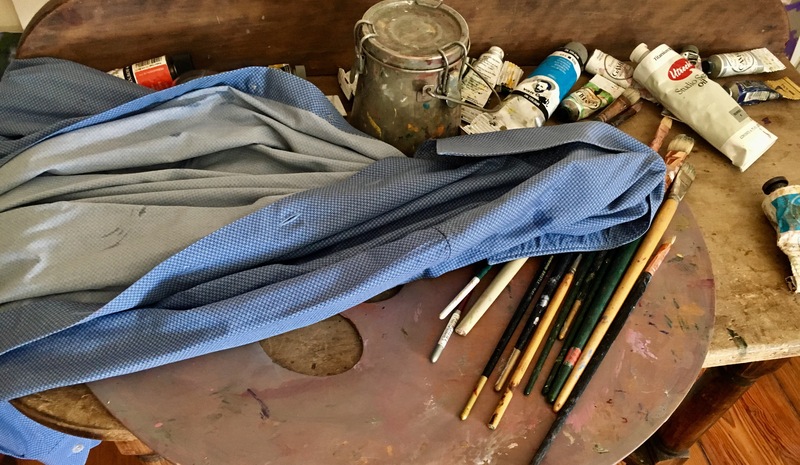 The shirt not only repels wrinkles, but oil paint too! Just kidding. That is where Jack’s Lindseed oil soap comes in. It is what I use to wash my paint brushes. It is non toxic, and smells like my Aunt KC’s tack shop in her barn (one of the best smells from my childhood). I use the soap to keep my brushes in tip top shape. An artist recently told me that artists have two types of clothes: those with paint on them, and those that don’t have paint on them YET. 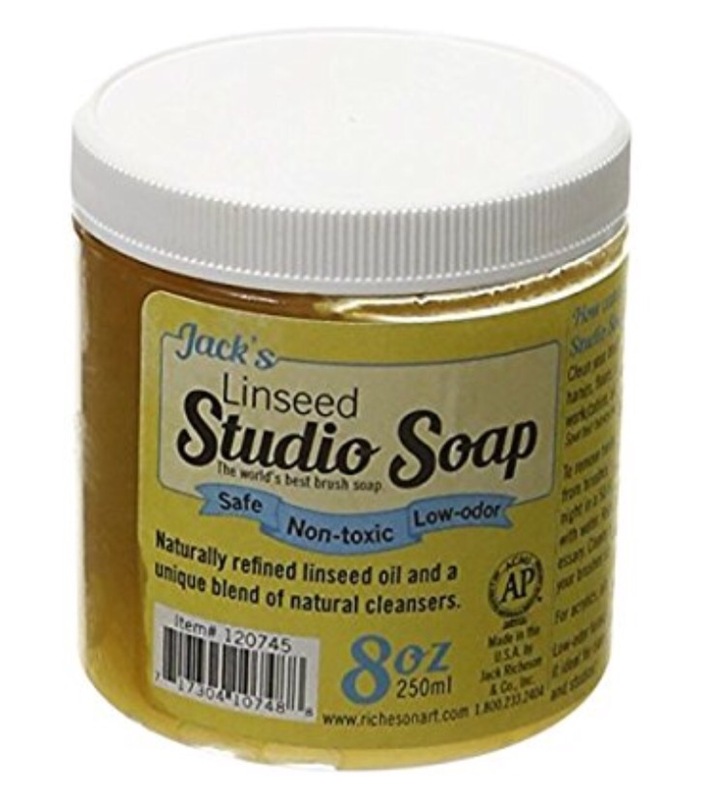 Jack’s linseed soap removes wet and DRY oil paint from clothes and paint brushes. The soap saved the shirt! 4. Wash with Jack’s studio soap and water, careful not to splay the bristles, I use a painting motion back in forth in the palm of my hand. Rinse. If bristles need shaping up, I put a bit more soap on and form the bristles back into their proper shape. I take great care of my brushes, and it shows. I have brushes that are 30 years old and still going strong. Previous Article wachoo doin’ with that hatchet? I love that shirt! Your husband has good taste in clothes.